Which puppy food is the best? 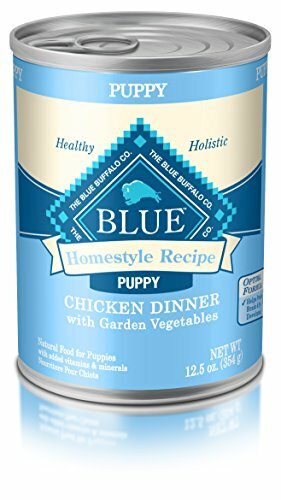 Should I choose Blue Buffalo for my growing puppy? Hi again, fellow puppy lovers! 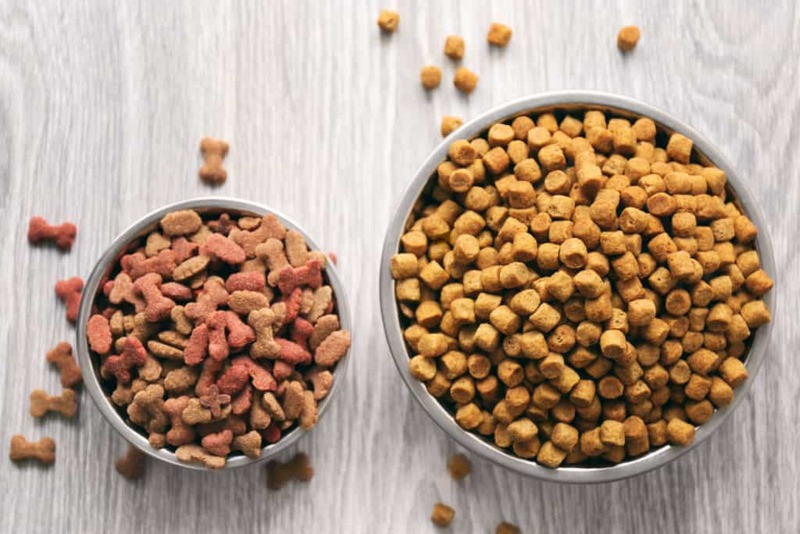 Today, we’ve put a little something together to help you make an informed choice when you’re browsing puppy foods and dog foods for your fluffy best friend. We’ve always got your pup’s health in mind when we’re doing our dog food reviews, and think there’s little that’s more important than knowing what your dog or puppy is eating. Our Blue Buffalo dog food reviews and Blue Buffalo puppy food reviews are brought to you only after carefully thought-through research and many long hours of label-reading. Here’s what we think, and what we LOVE about Blue Buffalo dog food and puppy food so you can spend less time looking online and more time with your trusty sidekick! 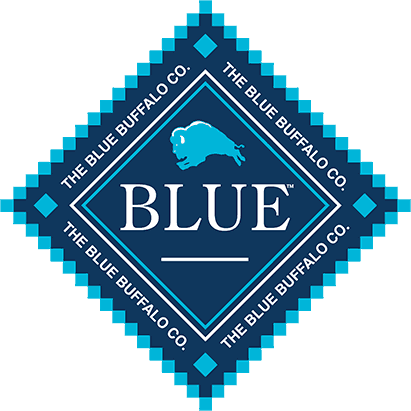 What’s special about Blue Buffalo? Why the Blue Buffalo puppy food reviews and Blue Buffalo dog food reviews? How do I know which one to pick from the Blue Buffalo Dog Food Reviews? Can I mix up dry puppy food and wet puppy food together? Blue Buffalo has got to be one of the nation’s MOST popular brands of dog food, which is why we’ve chosen to make a specialized Blue Buffalo Dog Food Review for all you dog parents. The reason being, that Blue Buffalo make a huge effort to ensure their puppy food and dog food is Natural, with a capital N! American company Blue Buffalo started up just over a decade ago when the founder’s family dog was going through some health issues. Together with his two sons, the small family team started to design their own, health-focused dog food that’s now available in a wide, WIDE range of formulas. Among these, there are countless options which are free of corn grains, wheat grains, and soy flour. A second and equally important fact about who Blue Buffalo are, is that as a brand they’ve put together a bunch of high-quality recipes with real, genuine meat as the topmost product. Isn’t that the way it should be? Blue Buffalo produce a diverse array of puppy foods and dog foods, so you’re free to choose between large, medium and smaller puppy and dog breeds. Each of these recipes is tailored to the energy and nutritional needs of different sized dogs, and there is so much variety that you can choose between large puppy grain-free wet food, small senior dry dog food with grains, medium adult grain-free dry food, and all the combinations in between. Please, though, don’t make us do the math! When you’re buying Blue Buffalo dog food, you’re also able to be sure about the fact that it won’t contain any nasty or scary preservatives or any non-natural versions of add-ins such as flavorings and colors. Instead, you’re giving your puppy or dog a formula which uses vitamin-based preserving agents such as tocopherols and citric acid. Of course, the amazing number of choices is a massive plus that merits a Blue Buffalo puppy food review in our books. 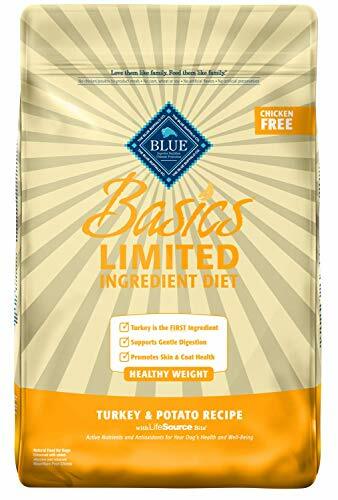 Lots of the many dog food choices you can make with Blue Buffalo also come in another whole range of different flavors, from lamb or turkey and potato, to garden veggies with homestyle chicken, to the delicious-sounding Santa Fe Grill. Apart from all this, we’ve been looking out especially in our puppy food reviews and dog food reviews for those brands that stand out with something extra special. When it comes to giving back to the community, we think Blue Buffalo does a super neat job by getting actively involved with caring for homeless and unadopted pets. And THAT’s why we’ve chosen to do Blue Buffalo dog food reviews and Blue puppy food reviews for your loyal friend! Two winners for this one, as we had so much choice! Puppy foods should be all about fuel for growth, and laying some solid foundations for life. If this kibble didn’t make both you and your puppy super happy, we’d be surprised! Parsley, kelp, blueberries and other vitamin-rich goodies! Here’s one for the adult dogs, and it’s another one that’s rich in Blue Buffalo’s signature LifeSource® bits. In case you didn’t know, those are cold-formed vitamin, antioxidant and mineral bonus bits that are unique to Blue Buffalo and are one of the reasons the brand is super healthy. This dog food is designed for medium-sized poochies, but can be flexibly fed to all breed sizes if you follow the helpful chart- so think anything from Yorkies to Rottweilers and Great Danes! Once again, there are more veggies and fruit than we can shake a stick at for bouncy, happy adult dogs! Grain-free yet abundant minerals and nutrients. That’s what we like to see. Cancer-fighting antioxidants and, as always with Blue Buffalo, pretty flexible- this time in terms of which doggies you can feed! 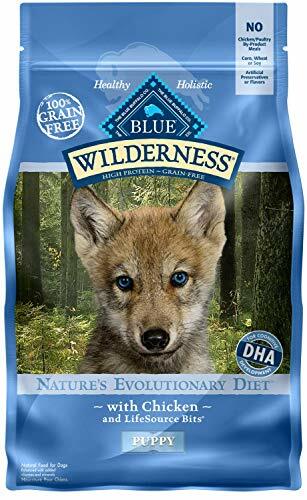 Blue Buffalo’s Wilderness line is inspired by wolf diets, or what they would usually be eating in the wild. So while it’s great for all dog types, it’s particularly suited to Pit Bulls who require a lot of protein, and also pretty darn cool to feed to your Husky so he can imagine he’s landed some wild reindeer! Once again, this is super awesome for breeds which use lots of day-to-day protein for muscle growth and maintenance. Pit Bull puppies, we’re looking right at you! Our only problem is that there aren’t more flavors of this awesome puppy food! Yeah, yeah, we know that’s not really a problem! 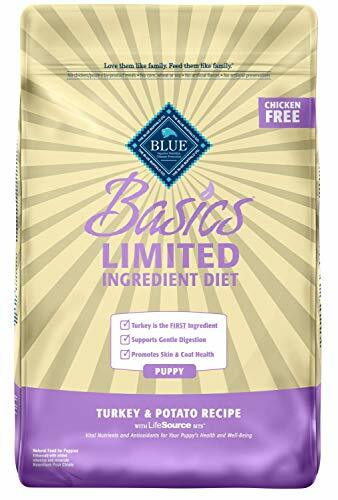 It’s products like Blue Wilderness puppy food that make Blue Buffalo puppy food reviews so worthwhile and enjoyable. As dog owners, we’re so glad that our strong, healthy puppies have options like this one. 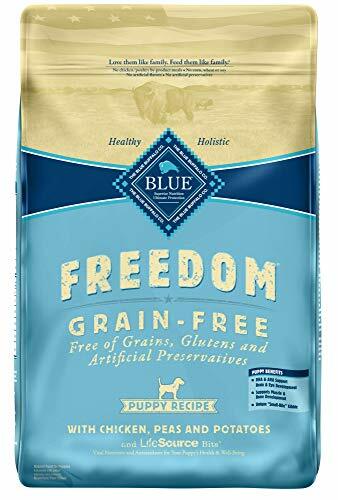 The BLUE Freedom range of puppy foods is uniquely focused on ensuring each and every one of our puppies gets all the required nutrients for growing up big and strong while cutting out potential allergens. This one’s specifically for the large puppy breeds! Turkey and chicken meals, after the list-topping boneless chicken! A whopping (or woofing?) 1.1% calcium! Nope, we love it for our large puppies! Winner, winner, chicken dinner! We’re impressed by the allergen-free approach that still manages to sound so delicious. Plus, for our larger dog and puppy breeds, this is carefully crafted so as to maintain a balanced profile of the required awesome nutrients for growth and a healthy life. It can be such a lovely, savory treat to give your sweet puppy something different once in a while, and the Homestyle wet puppy chow is an oh-so-considerate way to jazz things up for your growing buddy. Blue Buffalo have always been one of our special favorites, and they continue to impress us with this wholesome recipe. Carbs as fillers? No. Carbs for vitamins? Yes! This homestyle formula has potatoes, carrots and other garden veggies. That’s so cute…and healthy! A little higher price-wise than dry puppy kibble, but that’s no different from any other brand. The turkey formula we recommend especially, because turkey is, in fact, a pretty rare choice for puppy food and dog food recipes, yet it’s very easily digested compared to other meat choices. One of the downsides of having a puppy who can’t eat the popular meats like beef or chicken is that a lean meat replacement will not often have sufficient natural fat to make up the required daily fat. That means canola oil is the main fat source for this special puppy food. Feeding your puppy with a puppy food that’s high vegetable oil is only necessary if you’ve got a puppy who cannot tolerate certain meats. There’s absolutely no need to worry about this if you’ve got a pup who has sensitivities, however, because it’s a million times better than having a sick puppy dog on your hands. This formula is especially great for those adult dogs who are in need of a little weight loss for optimal health. Canola oil is the fat source once again, and once again it’s miles better than having your dog feel sick! Egg-free, free from those meats that commonly induce allergic reactions, and still high in glucosamine, Vitamins and lean-meat based. We’ve heard that dogs on this Blue Buffalo Basics food absolutely love it- they sure don’t look sad about being on a healthier diet! We reckon it’s cool that Blue Buffalo products make it super easy to understand which product might be the best dog food or puppy food for your pet. First up, there’s the long-raging debate about wet and dry food. There’s a lot about this in our breed-specific articles, and in short, there are pros and cons for each- the choice is yours (or your dog’s)! Choosing between different brands of dry dog food may seem a little trickier, but hopefully, our Blue Buffalo dog food reviews have made things a little simpler and more time-efficient. 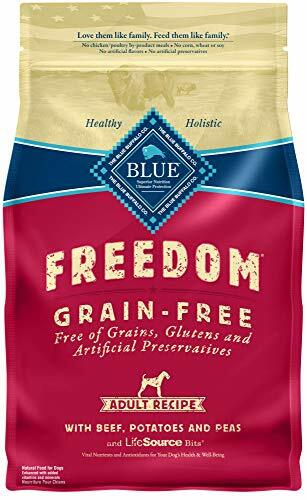 If your dog or puppy is allergic to gluten or any of the wheat, soy or corn fillers in his food, you’re in good hands with Blue Buffalo because it’s always grain free. However, dogs and puppies with specific food intolerances are best off sticking to the Limited-Ingredient formulas in case they’re sensitive to specific meat or egg products. Lastly, our Blue Buffalo puppy food reviews have picked out what we believe are the best products for growing pups, as they’re high in healthy, yummy protein, smaller-kibbled and great DHA sources! For adult dogs, a high amount of protein isn’t strictly necessary, so we suggest you choose something that’s tailored for mature dogs, like the adult dog food we’ve picked out at the bottom of our Blue Buffalo dog food reviews. Sure you can! It’s a fantastic way to ensure your puppy’s actually getting sufficient moisture in his or her diet. Because some dogs don’t tend to drink enough of the plain old good stuff, mixing together wet and dry food can help boost your puppy’s moisture intake. At the same time, it’s a sure-fire way to give your little one some variety when it comes to texture and taste, in the same way that some owners mix in a little water with their puppy’s dry puppy food. Is Rachael Ray Nutrish Dog Food Good For My Puppy? Is Canidae Dog Food a Good Choice? Does ACANA Make Good Puppy Food? Is 4Health Dog Food Good For My Puppy? Should I Choose Kirkland Dog Food For My Puppy? 0 - 4 mo. 5 - 18 mo.